The SR 525 Mukilteo Ferry Terminal – Tank Farm Pier Demolition and Dredging project was selected for the 2017 AGC Build Washington Award for Heavy/Industrial construction of $5,000,000-$20,000,000. AGC of Washington’s annual Build Washington Awards program recognizes the outstanding performance of AGC members. Demolition of the former U.S. Department of Defense Fuel Supply Point Facility in Mukilteo known as the “Tank Farm” property included a large pier extending into Possession Sound. 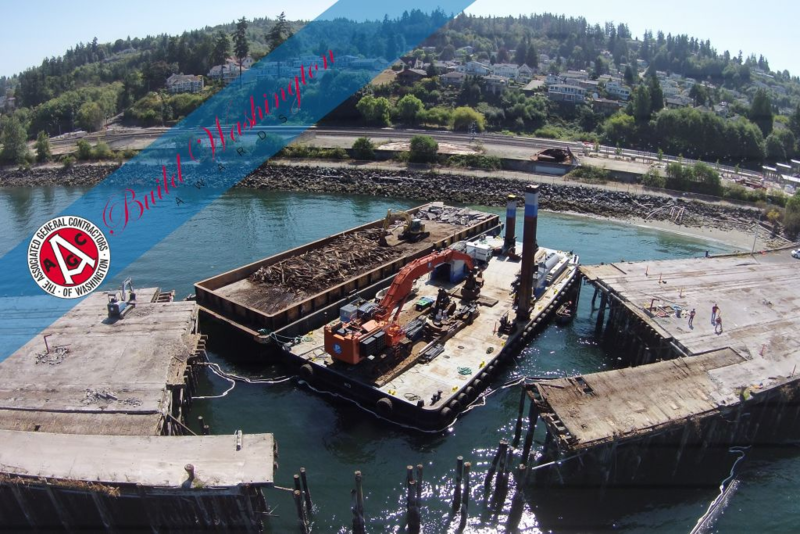 The Project removed 138,080 SF (3.17 acres) of over water timber pier including approximately 3,900 creosote-treated piles in a single season including 21,000 CY of material was dredged in the navigation channel for open-water disposal. Over 7,000 tons of toxic creosote timber was removed as part of the demolition without incident. Congratulations to the project team for an outstanding job in both construction and safety. The award ceremony will be held this year at the Museum of Flight on May 25.